Rode up around 5:00 with my tools and some goodies from Menards. It’s been unseasonably cool lately but things are warming back up for the weekend. The first thing I noticed upon unlocking the door and stepping into the trailer is that the place smells great! I think the cabinet renovation took care of the worst of the pest infestation as my two mousetraps remain un-tripped. The true test will come when the weather turns cold and the little critters start looking for somewhere out of the elements to hunker down. Keep looking, you monsters; no vacancy. Unloaded the truck and got to work putting the finishing touches on the recent trailer improvements. 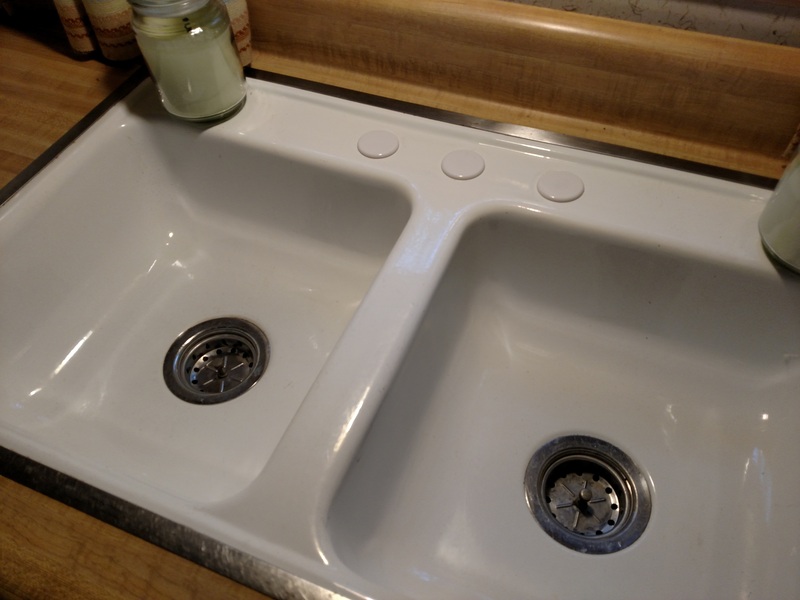 I capped the holes in the kitchen sink that were left from taking out the useless faucet and installed carpet edging around the new lineoleum. I also brought up carpet edging for the bathroom door, a trim strip for the carpet seam in the hallway, and some quarter-round for the base of the kitchen cabinet and walls. I will save that work for another trip, however. My main focus now is the pole barn. 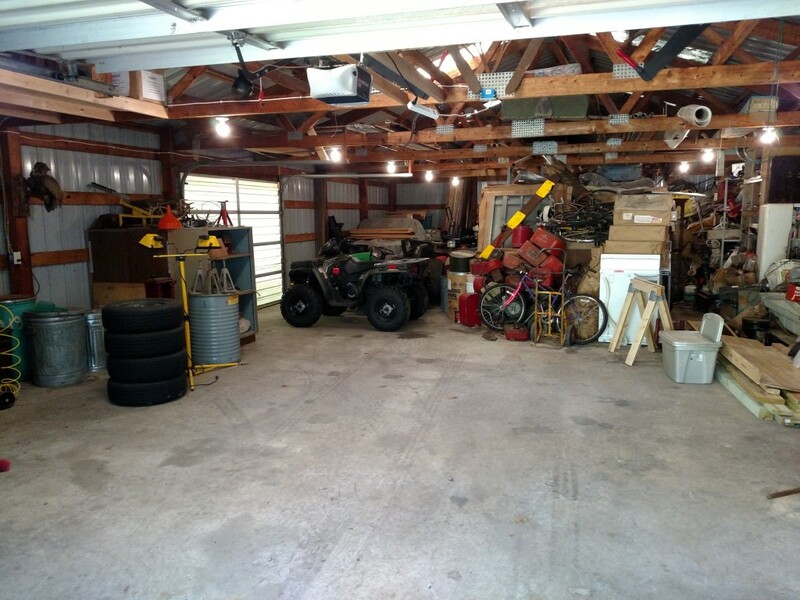 I wanted to finally lay claim to the back corner of the building, so I started by clearing out all the vehicles: green ATV, blue ATV, red ATV, new mower, old mower, Defiant, and the old red boat. Enterprise is still at my house in Oshkosh and dad has the blue utility trailer in Mayville, so that helps. With everything mobile out of the way, I got my first real good look at the corner. 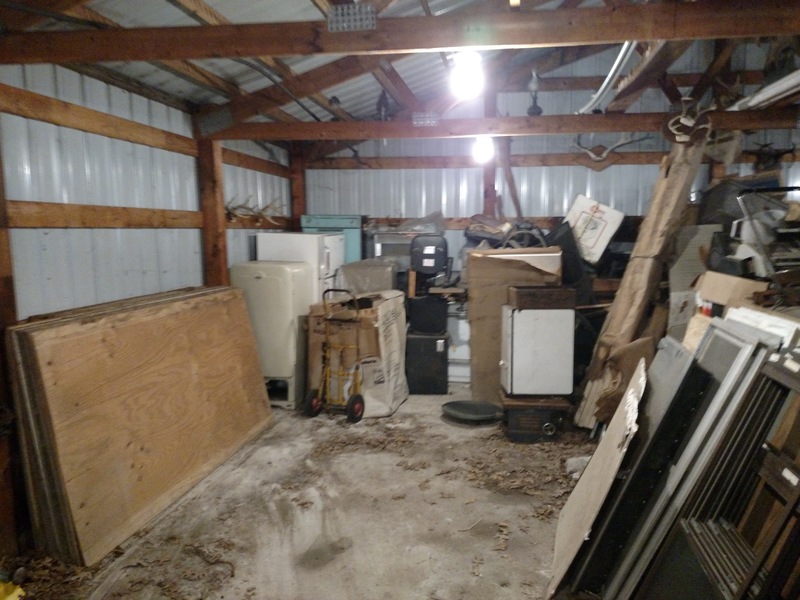 Most of the space is taken up by old appliances that we can either scrap out or, in the case of the refrigerators, possibly turn in for energy credit. I started the unenviable task of carting these relics outside. I took a short break for dinner, a frozen pizza made in the pizza oven. I grabbed some water and Gatorade and headed back to the pole barn. 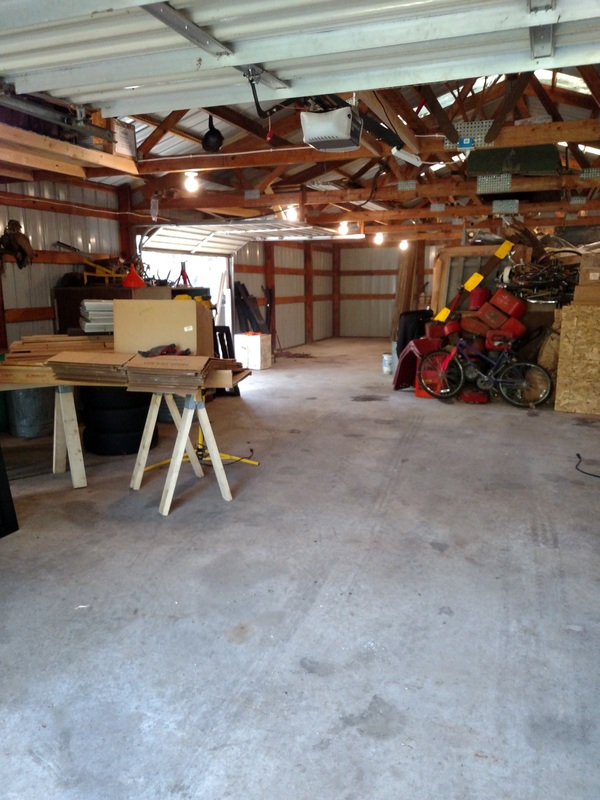 With the appliances removed, I turned my attention to the building materials that were gathered back there. A lot of the plywood sheets that were stacked on the north wall are still in great shape, but there were a lot of smaller cut-off sections of pegboard and paneling that had been closer to the east wall with water damage and mold. I think snow must blow through the gap between the sheet metal on the wall and roof because everything along the back wall has the same problem. 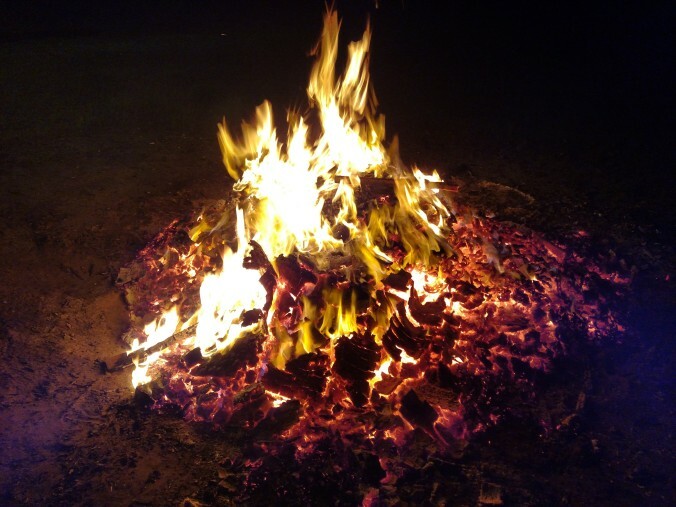 I hauled these items over to the burnpit and lit them up. I had some company out there; a pair of barred owls were calling back and forth and one was very close; it might have even been in one of the oaks next to the pole barn. Called it a night pretty late. It was well after midnight when I closed up the pole barn. Washed up and went right to bed. Sorry, Aunt Judy. I’d love to stop in but I’ve got some work ahead of me. Made do with more frozen pizza for breakfast and then back to the pole barn to finish reclaiming the corner. After sorting out the panelling, I made quite a dent behind the large “center stack” that Red, Farmer Joe, and I made 5 years ago. Two of the things I uncovered last night were a giant 220-volt, (at least) 50-gallon air compressor and a refrigerator-sized, fancy-looking wood burning stove. I was able to maneuver these into the new opening along with the woodworking tools I picked up from Paco’s work. After sweeping out the whole corner and taking a moment to marvel at the emptiness, I began repopulating it. I consolidated all of the good plywood bundles into one stack along the east wall. With no trusses in the way, I was able to stand them on end to save on floor space. I brought in the old red boat, Defiant, the red ATV, and the old mower. I arranged them all back in the corner without obstructing the side door, leaving enough room so that a person could still walk around them. The green ATV and new mower park in front of the side door now, leaving a huge open area in the front of the building without having to drive a bunch of equipment out first. 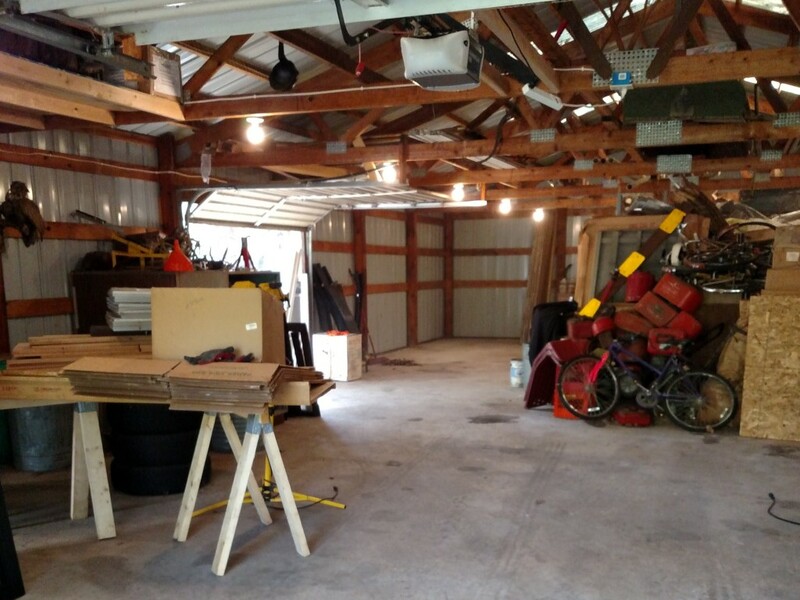 I put the Packer game on the shop radio as I finished cleaning in the pole barn. It helped the day feel like Fall even though the temperature is in the low-70s and all the trees are still green. Got my tools packed, locked up the trailer, and ran the marsh loop with the blue ATV before shutting the door on the now-roomy pole barn. Headed out around 2:00.